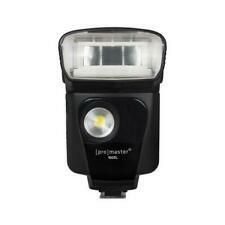 BRAND NEW ProMaster FL100 Flash - For Canon EOS DSLR Camera - 9378. Opened box for inspection  . 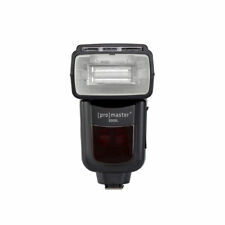 BRAND NEW Promaster FL100 Flash for Nikon #9385. The 200SL's wireless TTL ablities provide ultimate flash freedom and advanced multi-light options. A quality stoage case is included which holds the 200SL along with 3 spare AA batteries so you won't run out of power. 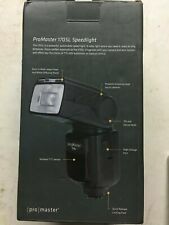 ProMaster 170SL Speedlight for Sony M.I.S. The articulating head can be adjusted for a variety of swivel and bounce positions; and is compatible with many light modifiers. The 170SL powerful guide number of 52m/171ft combined with 180mm zoom head can illuminate subjects from afar. Excellent Electronic flash for all Nikon DSLRs. Was used with a Nikon D3200, D5300, D800E & D750. 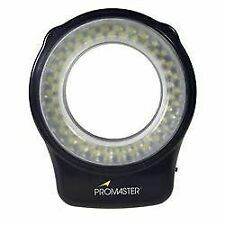 The Promaster RL100 Macro LED Ringflash incorporates super bright LED technology. Works with any standard hot shoe. Flash includes mounting rings for lenses with filter threads of 49, 52, 55, 58, 62, 67, 72, and 77mm. Its hybrid design gives you the option of an LED light for videos or flash for still photos. Use it in a wireless flash system as a master or slave unit. Portfolio & Archival Storage. LED light for videography. Its hybrid design gives you the option of an LED light for videos or flash for still photos. Use it in a wireless flash system as a master or slave unit. LED light for videography. Once we receive and inspect the product we will credit your account. THIS SEEMS TO WORK GREAT. Specifications: Guide Number: (ISO 100) 157"/48m at 105mm position Bounce Position: -7?. Swivel Position: Right 0?. Flash, (4) Diffuser Rings: Translucent (Installed), Matte, Yellow and Blue. Flash: No Issues Found. Flash Type: Auto (Non-TTL). The following information describes what we've found about this product during our evaluation. The box, case and stand are all included. Item # S040208. 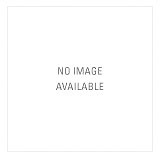 The overall condition is LN-. Use this handy tool to mount soft boxes, barndoors, snoots, and other accessories from your studio lighting setup to your shoe mount flash. ProMaster 200SL Nikon Speedlight. This item is being sold as used and AS IS. The flash body shows little to no signs of use. You need not operate the slave unit(s) at all during the shoot. Wireless flash can be used in TTL,M,and RPT modes. Bought this for a last minute out of town photo shoot but didn’t need to use it. Promaster Macrolume TTL Digital Ring Light/Macro Flash with Canon 5050DXR Digital Module code #7133. Condition is mint - doesn't look used. Battery compartment is perfect. Uses Cokin P series mounting rings, and comes with 62mm and 67mm lens rings. Has paperwork, but no box. My home is smoke free. CONUSA only please. VERY NICE 7500DX IN GOOD PLUS CONDITION AND WORKS GREAT. will need 4 AAA batteries. NIB FL1 Pro Master Professional Electronic Flash for NIKON Code 1247. Built-in fill flash enhances foreground detail when using the main flash in the bounce mode. BOUNCE ANGLE. Flash stand. flash / speedlight. Use this L bracket to attach your camera to a tripod head with a ProMaster dovetail / arca-swiss dovetail type quick release system. The PROMASTER PROFESSIONAL L BRACKET is machined of high grade aluminum and includes everything you need to properly assemble and connect it. Use this L bracket to attach your camera to a tripod head with a ProMaster dovetail / arca-swiss dovetail type quick release system. Once the L bracket is mounted to your camera you can connect it horizontally or vertically and switch between these positions in just seconds. By keeping your camera centered above the tripod head, even when using a vertical position, you will have a much better balanced rig and better stability. New in the original box as pictured, never used. Features include-. GN 100' @ ISO 100. Like other EDF models, the 2500 EDF is fully reprogrammable to ensure that it remains compatible with the latest flash technology. • Flash upgradeable by your PROMASTER dealer. Model #:PM 2979 - Fits Canon. This Promaster flash covers a wide area such as 92 degrees horizontal and 75 degrees vertical using its wide angle of coverage. Throw light at areas ranging from 0 to 180 degrees using the swivel angle of this Promaster digital electronic flash. BRAND NEW Promaster 7200EDF Digital Electronic Flash for Sony. PROMASTER FT 1700 ELECTRONIC FLASH. NEW, UNOPENED BOX (small dent on paper box as shown on pic). Features include-. GN 120' @ ISO 100. Bounce Angles from 0 to 90. Weighs 8.8 oz (w/o Batteries). Features: ---Guide Number: (ISO 100) 60m/200' at 180mm reflector position ---Bounce Position: -7°, 0°, 45°, 60°, 75°, 90° ---Swivel Position: Right 0° - 180°; Left 0° - 90° ---Flash Coverage: 24 - 180mm (18mm with wide panel) ---Auto/Manual zoom ---Built-in wide panel (18mm) and bounce reflector ---Flash Duration: 1/800 - 1/20,000 second ---Color Temperature: 5600K ---Exposure Compensation: /-6 EV in 1/3 EV increments ---Master/Slave Mode: Optical pulse with 3 groups, 4 channels ---Recycling Time: Alkaline cells 0.27-5.25; NiMh cells 0.15-3 seconds DIMENSIONS 7 3/4" x 3 1/16" x 2 5/16" / 196.8mm x 77.8mm x 58.7mm WEIGHT 425 grams POWER SOURCE 4x 1.5V AA alkaline batteries TYPE OF UNIT flash / speedlight. Tested works good, pls feel free to make an offer. 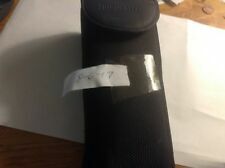 BRAND NEW Promaster Digital 7400EDF Shoe Mount Flash For Pentax / Samsung. NEW in OPENED box. Never used. The PROMASTER 100SL for Sony multi-interface shoe sports a full complement of advanced features in a small form factor. Its hybrid design gives you the option of an LED light for videos or flash for still photos. The 100SL is well-balanced so it 'just feels right' on your camera while throwing a flattering quality of light towards your subject. You can even use the 100SL to remotely fire your camera. The 100SL for Sony M.I.S. This flash has been tested and is in excellent condition. ProMaster 7500 EDF electronic flash for Nikon. Comes with original box and instruction booklet. Used condition. It includes many advanced features including motorized zoom, multiple and modeling modes, and remote slave function. Along with all of these great features, you get full TTL integration with your digital SLR.